House label from Chicago, Il., USA, most productive in the late eighties to early nineties. Also credited on the releases as Hot Mix 5 Inc., Hot Mix 5. The record label was started in 1986 by three of the members from WBMX's Hot Mix 5. 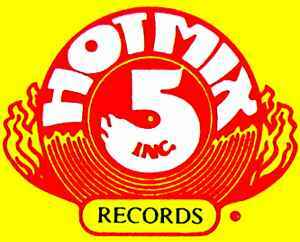 The Hot Mix 5 were a group of DJ's originally consisting of Scott "Smokin" Silz, Kenny "Jammin" Jason, Farley "Funkin" Keith, Mickey "Mixin" Oliver and Ralphi "Rockin" Rosario. They were to be called the Hot Mix 6 but Jeff Davis failed to show up for his interview. They started with a radio show on WBMX called Hot Mix Dance Party. The three primary members involved with the label were Mickey "Mixin" Oliver, Kenny "Jammin" Jason and Ralphi Rosario. Hot Mix 5 Records Inc.